Migraines are a chronic problem and complicated migraine symptoms can often be worse than the pain phase itself. One of the problems with diagnosing these symptoms is that they often mimic other serious medical problems. So, you get tested for a brain tumour, stroke and MS (multiple sclerosis) to rule them out. They can definitely be scary and debilitating. Complicated migraine symptoms can be worse than the pain phase. This makes it difficult for doctors and for us as patients. If you have these debilitating symptoms, then I suggest becoming familiar with your own early warning signals, and some of the more serious signs below. "how lucky are you to have an early warning like that!" I was just starting to panic and tell her that I was triggered by the perfumed shampoo she was using. I could feel my heart rate increase and my breathing (and sheer panic arise) when I thought... hang on a minute, she's right. I can use this to help. Now I am thankful for that inner awareness... that subtle clue and I can take immediate action to stop the attack from escalating. Your family can also help you notice warning signs of an impending migraine. Things like: insomnia, food cravings, unexplained mood swings, or temper tantrums and irritability. That’s where the family comes in. They can let you know when they see the shift. If you experience unexplained anger before an attack, reading Taboo Symptoms of Migraine: Anger might help you recognize it as a warning sign and start treating it as a symptom too. Aneurysms can be dismissed as severe migraines. If an aneurysm is ruptured and leaking it can produce a headache like nothing you’ve experienced before. It’s difficult to tell the difference between this and intensely disabling complicated migraine symptoms. Don’t go rushing off to the hospital... but if your regular routine and abortives are not helping, it could be something else... like an aneurysm. Approximately 15 percent of people that have migraines suffer from migraines with aura. 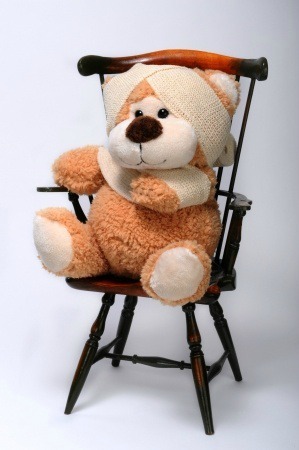 These migraines used to be called classic, classical migraine or complicated migraine. Now complicated migraine is more a descriptive term. The International Headache Society started categorizing headaches into different groups by their characteristics. The other 85 percent of migraineurs have migraine without aura. But there is also a small percentage that has characteristics unlike these two categories. These people have the more scary complicated migraine symptoms. I find symptoms like paralysis, or difficulty using one side of the body or difficulty forming a sentence and talking... very scary. I don't get the paralysis often, thank goodness, but I do get the speech and cognition problems regularly. These are the symptoms that can often be misdiagnosed as stroke symptoms. With the more complicated migraines and symptoms comes greater risk of a stroke. These types of symptoms might need to be treated independently from the migraine headache pain phase. Click here to read my full article on migraine stroke symptoms to help you identify the differences. 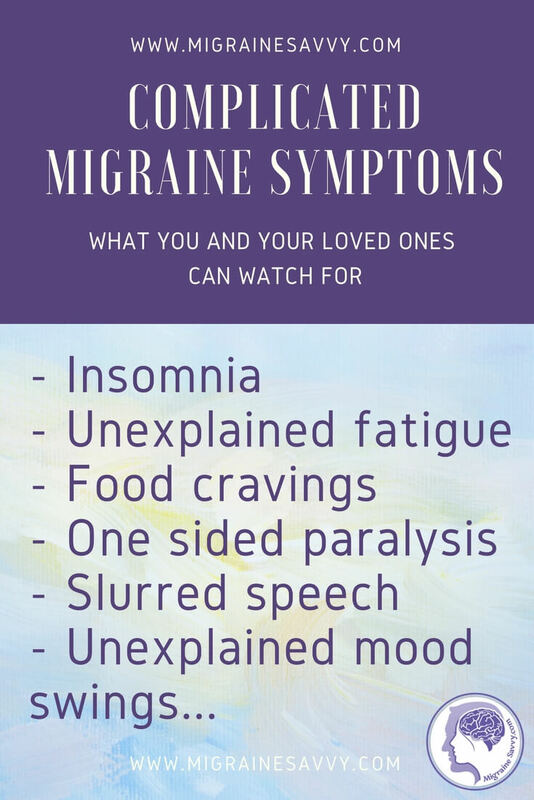 If you experience any of these symptoms with a migraine, go to your physician and get checked out immediately. 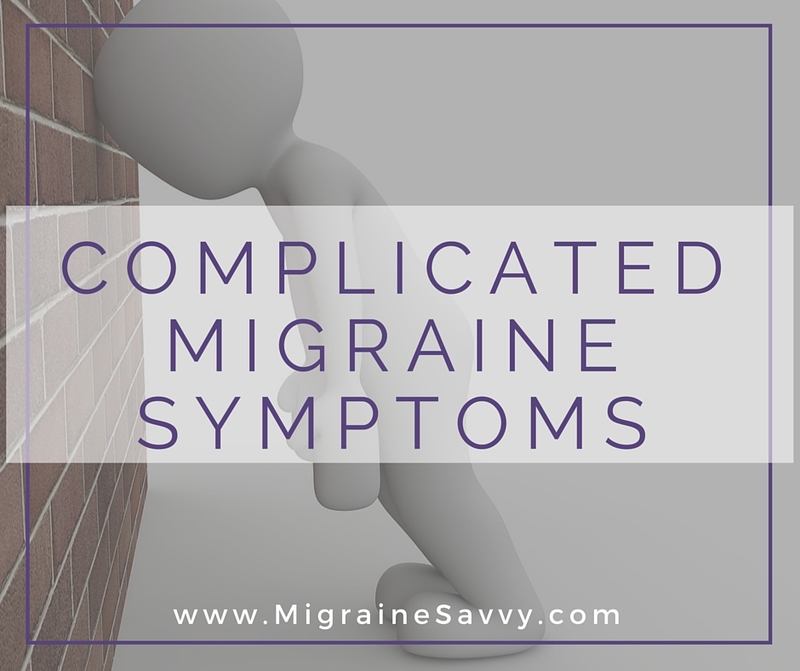 If you get these more complicated migraines, you might also find that your symptoms can vary from migraine to migraine. You might get symptoms before, during and after the pain phase, or only in one phase. No two migraine sufferers get the exact same symptoms , so just be aware that your patterns and symptoms can vary. This complicated migraine affects half of the body. The affected half becomes weak during the headache phase. If you suffer from hemiplegic migraine, you will usually have a family history of this exact type of migraine. Weakness on one side of your body - including your face, arm, and leg. Numbness or tingling in the affected side of your face or limb. Migraines are often described as starting on one side of the head and then gradually spreading and intensifying to the headache or pain phase. This migraine, also called basilar artery migraine, may or may not be accompanied by a headache. Ophthalmoplegic migraine, also known as ocular migraine, is a rare type of migraine headache where the focal point of pain is in and around the eyes. With this attack, your eyelid will droop and you can't move your eye from one side to the other. The entire episode is typically very brief, and is normally accompanied by intense eye pain. I've written more about ocular migraines here - Top Tips To Deal With Ocular Migraines. A retinal migraine, or ocular migraine, is a rare form of migraine. So, this headache causes the very sudden vision loss in one eye and is accompanied by a headache. This typically lasts about an hour. Hypnic headache syndrome is rare. It usually strikes people over the age of 50, but it can affect people from 40 years old to 80. It occurs at the same time every night and lasts about fifteen minutes to one hour. If you wake up between 1 and 3 am every night... this might be your diagnosis. The typical headache medication is not effective, but caffeine can be effective for the pain... but it might keep you awake ALL night. Unilateral pain (on one side of the head) or can be bilateral (on both sides of the head). Throbbing pain, although not everyone experiences this. Now you see why complicated migraine symptoms can be hard to diagnosis and why they could scare you. If you have any symptoms out of the 'norm', seek medical diagnosis and advice asap. unexplained mood changes, and sudden irritability. Become familiar with your early warning signs and symptoms, and tell your friends and family what to watch for so they can help you prepare for the impending attack. Once you have been to your doctor, and you have been diagnosed with migraine. S/he will go over some treatment options. For these complicated migraine symptoms, medication is normally part of the treatment. And will be one of the first things you do at your earliest warning signal.